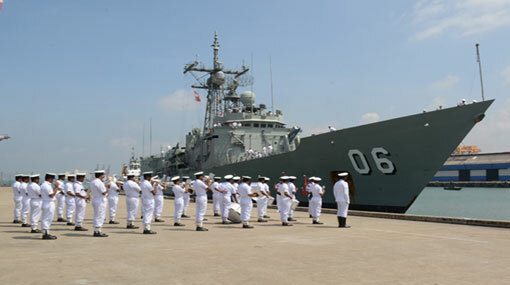 The Royal Australian Navy Ship ‘HMAS Newcastle’ arrived at the port of Colombo on a goodwill visit today (14th November). Sri Lanka Navy welcomed the visiting ship in accordance with naval traditions, upon her arrival. The vessel with a length of 138.1 m and width of 14.3 m is manned by a crew of 184. The displacement of the ‘Newcastle’ is 4,200 tons. During their four-day official visit, the crew members of the vessel are scheduled to take part in several events organized by the Sri Lanka Navy. The ship is due to depart from the Colombo harbour on 17th November.